Hello!!! I am EXTREMELY EXCITED!!!!!!!! Because it's time again for our annual Popcorn Show and Sells to begin, and soon time to start selling popcorn on an individual basis! Show and sells are basically set up in appearance much like the Girl Scout cookie sale tables that you see around. (except that ours is better because it's for the Cub Scouts, not that I am biased in any way :-) The pack has pre-ordered Popcorn products to bring to the Show and sells to be used as “cash and carry” sales..Although we will be accepting Credit cards this year!!! CLASS A UNIFORM REQUIRED. 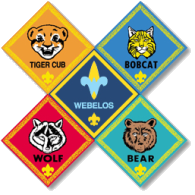 If you are New to Scouts this year and have not purchased a Cub Scout Uniform please contact me and we will try to accommodate by borrowing a Class b shirt for the Cub to wear. Each Scout should have their own Cub Scout uniform by the beginning of the Scout Year (Sept 10th,) or shortly thereafter if at all possible. Information regarding uniforms will be provided at our round up night on Sept 10th, Details are also available by Contacting the Leadership or by visiting the pack Website. Link to the Scout shop is on our site, and the Scout shop will be glad to help you with all the details about Uniforms. For those of you who are new to Scouting, each year the Boy Scouts of America teams up with the Trails End popcorn company to sell popcorn as the official fundraiser for the Boy Scouts of America. In a few weeks you will be receiving your official popcorn order form and information packet with all the details for the "take order" portion of the program. That portion is you and your Scout “taking orders” from your neighbors, work, friends, family, etc, and turning the order form and the money in to us in late October. (always best to ask for the money from the Customer when you are taking their order) There will be more details in future emails and also an official popcorn kick-off. There is a possibility that we may be handing out the Popcorn packets prior to the Kick-off and the official round up night for the Scout year. More details to follow.